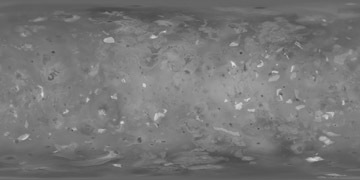 This largely fictional digital elevation model (DEM) was created by processing a high resolution grayscale version of a map I created of Io using Galileo and Voyager images. I then used a list of all known mountains on Io to manually paint in all of the known mountains using images of them as a guide. The relative heights of the mountains aren't accurate but their overall appearance should be fairly realistic in global views. In particular, the terminator appears more realistic with this map than without it. I get nice results by setting black to -5 km and white to 10 km. The map is in simple cylindrical projection with latitudes running with a uniform interval from -90 (bottom) to 90 (top) and longitude 0 at the left edge of the map. Click the map below to view the 4096x2048 pixel full size DEM.